Hunx – Always Forever from Hardly Art on Vimeo. I’ve loved Hunx since I saw him at the Funhouse for Gay Pride in Seattle in 2009. I was wearing my “Guitar Fag” tee shirt I bought from Hunx when I recently met Chris and Neil (aka Pet Shop Boys.) Chris thought it said “Guilty Fag” so of course I corrected one of my favorite pop stars and told him who Hunx and his Punx were. Neil asked what they sounded like, so I told him; The Ronettes meets The Toy Dolls in a helium factory. “What’s their name, again?” Neil asked. So yeah, they are/he is GREAT! Hunx looks like he’s flying solo this time around, but sounds pretty much the way you’d expect, basically like the Punx never left. In a way, this looks to be the first great record from Hunx. I’ll explain. The first collection of Hunx material consists of a collection of 7″ records which were fun and a little off the rails, while the first proper album, Too Young To Be In Love was a collection of songs which sounded like they were trying too hard. The genius of some of the earlier 7″s was that they were quick and catchy. On Too Young To Be In Love, there were longer intros, repeated choruses, and an overall feeling of a band who were possibly trying a little too hard. I want everyone to know how great Hunx is, and if the new single is any sign, this could be the one! “Always Forever” is a two minute pop gem. Most of these songs were written late at night in my bedroom when I was going through really dark periods. Sometimes I wouldn’t even remember writing the songs and would just find the demos days later. The record was recorded in NYC by Ivan Julian, original member of Richard Hell and The Voidoids. I feel a really strong bond with him and loved making this record. 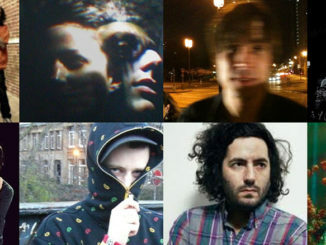 Hunx’s scoop, track by track at the Hardly Art site. There’s an MP3 download of “Always Forever” and you can preorder the album too. Hairdresser Blues is out on Hardly Art on February 28th. Hunx plays the Crocodile in Seattle on March 23rd, 2012. Goldfrapp Reveals Details of New SINGLES Compilation and the Gorgeous New “Yellow Halo” Video. 12/13/2011 Phil Pickens Videos Comments Off on Goldfrapp Reveals Details of New SINGLES Compilation and the Gorgeous New “Yellow Halo” Video.